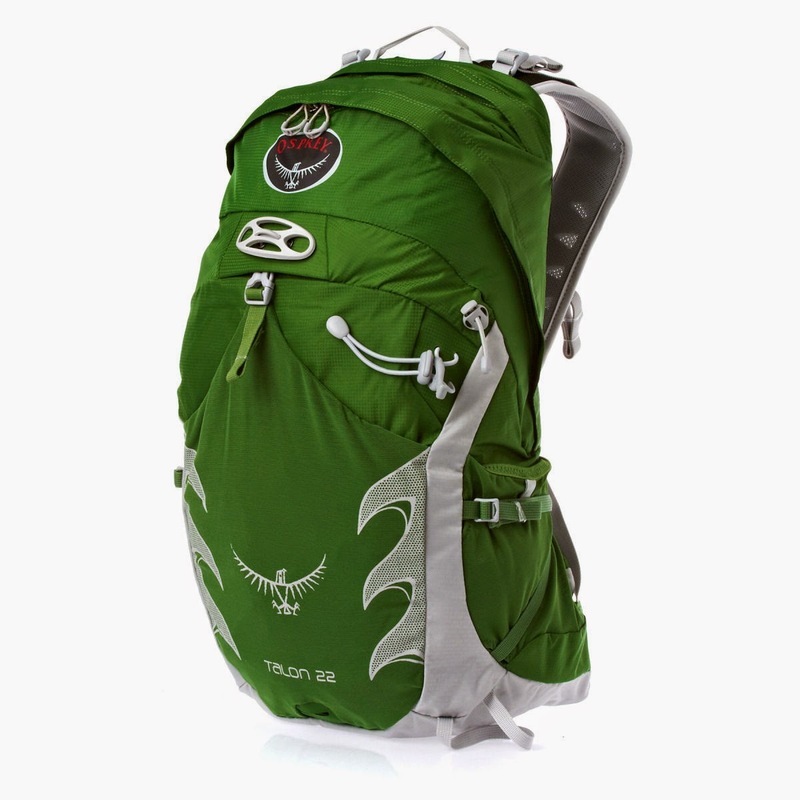 Osprey Talon 22 Review of a great little pack that has a lot of features. Believe it or not my first impression was: “that is rather small pack.” But then it is only a 22 litre so this should have been expected. I then started to inspect all the features that come with this pack, of which there are quite a few. Something I noticed quite quickly was the lack of a waterproof cover, which was not a little disconcerting. I also looked at the build quality and on first impressions I was not overly surprised that is looked very strong and robust yet flexible, considering the reputation that Osprey have in making high quality packs. This pack has been designed for someone who takes part in multiply sports in my opinion, all the main features focuses on biking and hiking. And there are a lot of really useful features on this pack for anything really. This for me makes its a great all round day pack. Osprey mention all the features in the description above and here is my opinion of them. The front stretch pocket does stretch, a lot, I easily got my waterproof in pocket, but, it does depend to a small degree on how full the pack. 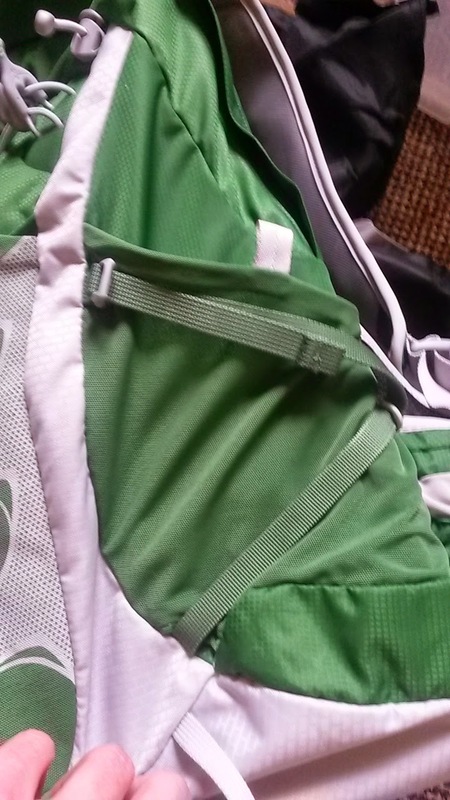 The side pockets have the Osprey lnside out compression system. Which is gives the flexibility of two different compression systems. 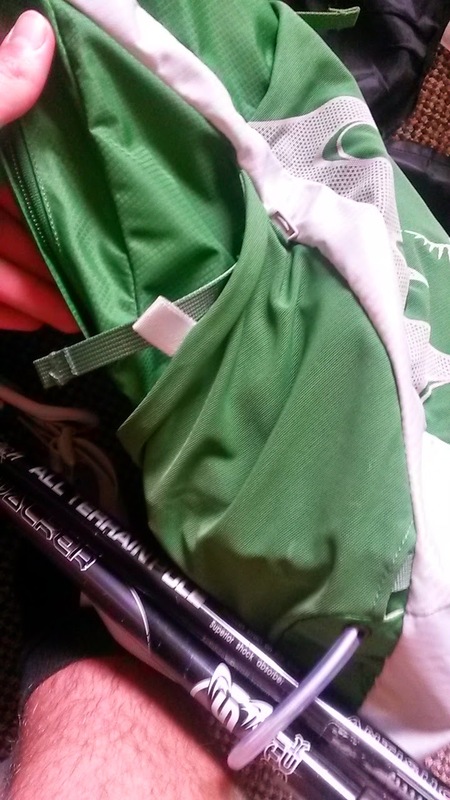 (Pictured below) The two mesh hip belts also stretch nicely allowing for things like a GPS, camera, compass and snacks. The stretchy pocket on shoulder strap is a good size for a compass, GPS or phone, although I personally found that it was a bit of struggle to get in and out of, as the opening was a little bit limited. The hydration system makes it so refilling it is no biggie and it does not make the pack uncomfortable to wear, when the bladder is full. Which brings me on to the comfort of the pack, which is pretty good even under weight, as fits really close to your back yet provides good ventilation. The pack is also fully adjustable to your back length to get the adjustment spot on, which is rather good considering I have strange length back. The Stow-and-Go trekking pole attachment, one of the main features of this pack, works really well even with two poles. I was hard pushed to even fell the poles whilst I was walking they fit that snugly. The capacity is suitable for a day out on the hills, mountain biking or in town, I did try to take this pack climbing, but it was just to small to fit all my gear. Having said that the LidLock bike attachment worked well with my climbing helmet (a Petzl Metetor 3+). The Osprey Insideout Compression system, is a strange one at first I was confused as to why they where different until I realised that both compression straps can be put on the inside or the outside of the pocket. I think this pack really is a great piece of kit with huge variety of features to just make things that much easier when out and about. 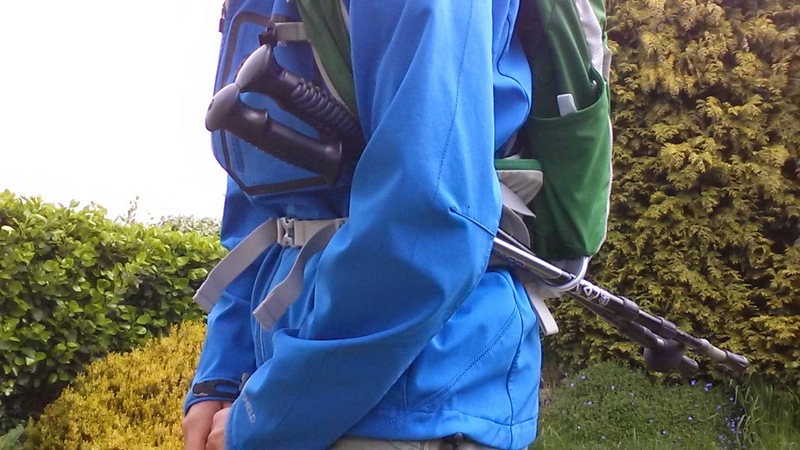 In particular I really do like the Stow-and-Go trekking pole attachment, it is really clever whoever came up with it. In some areas the pack is slightly overcrowded, but I think it is because it a small pack with a lot features. My only real thing is that this pack has no external waterproof cover. And for me personally I still rather take something a little bigger out on the hills, but I would grab this pack before anything else to just take out to the town or to work or a short town walk. Overall this is an excellent pack with multiple uses, that I can see me using a lot. Thanks for reading and please have a look at the rest of my blog, If you have any question please feel free to contact me on Facebook or Twitter.